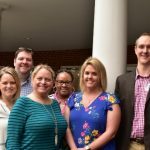 Welcome to Southern Pharmacy Services! We’re an energetic and dedicated group serving the pharmacy needs of long-term care communities. We are committed to providing the highest quality service and offering tailored solutions, efficiently and accurately. Building on the success of our 2018 anniversary event, Southern Pharmacy Services will host a 2019 Customer Appreciation & Education Conference in Greensboro, North Carolina on November 7 and 8. Several Kernersville employees attended the 25th Annual Friends of UMAR luncheon held in Charlotte, NC on March 26th.